The aim of the book is to provide a text which brings together the expertise from two separate disciplines applied to a shared problem; that of hearing impairment resulting from an infectious cause. The book has been written to be accessible to both disciplines. It begins with chapters describing the anatomy and function of the ear and its development to allow those unfamiliar with the ear to understand how the pathogen can affect hearing. 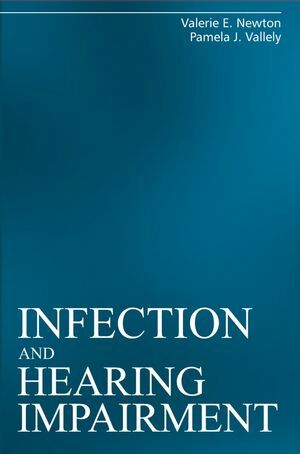 The following chapters include background information on the relevant viruses, bacteria and other pathogens so that those less familiar with these organisms will be able to understand the context within which they may affect the ear. The book also considers current ways in which these infections may be diagnosed, treated, and the potential for prevention. 1. Basic Anatomy and Physiology of the Ear (J. Irwin). 2. Development of the Ear and of Hearing (V.E. Newton). 4. Cytomegalovirus (S.B. Boppana and W.J. Britt). 8. Toxoplasma Infection and the Ear (B. Stray-Pedersen). 9. Sexually Transmitted Infections (P. Turner). 10. Otitis Media (J.J. Gröte and P.J. Vallely). 11. Meningitis and Hearing Loss (K.J. Mutton and E.B. Kaczmarski). 12. Infectious Diseases and Hearing in the Tropics (R. Hinchcliffe and S. Prasansuk). 13. Ototoxic Drugs (R. Taylor and A. Forge). 14. Laboratory Diagnosis, Treatment and Prevention of Infection Leading to Hearing Loss (P.E. Klapper and P.J. Vallely). 15. The Experience of Deafness – Psychosocial Effects (A. Young).